Astronomers typically assume that the initial mass function (the initial distribution of stars as a function of stellar mass) is universal, meaning that the ratio of low-mass stars to high-mass stars in a newborn stellar population is the same throughout the universe. In this paper, Cappellari et al. argue that the IMF actually varies significantly depending on the evolutionary history of a galaxy. They find that some galaxies are best described by IMFs with fewer low-mass stars while other galaxies are best fit by IMFs with more low-mass stars. Excitingly, their result implies that stars are “aware” of their galactic environments: the IMF in a particular galaxy depends on the history of that galaxy! Cappellari et al. arrived at their conclusion that the IMF is not universal by modeling the stellar and dark matter components of 260 elliptical and lenticular galaxies observed in the ATLAS3D project. For each galaxy, they determined the mass-to-light ratio of the stellar population by using a dynamical model to account for the stellar kinematics. Because stellar luminosity does not scale linearly with stellar mass, the stellar population mass-to-light ratio can be used as a proxy for the ratio of high-mass stars to low-mass stars. For instance, a 2 solar mass star has a mass-to-light ratio of 0.16 while a 0.5 solar mass star has a mass-to-light ratio of 6.5. A galaxy containing many more low-mass stars would therefore have a significantly higher total stellar mass-to-light ratio than a galaxy with fewer low-mass stars. After determining the overall stellar mass-to-light ratio of each galaxy, Cappellari et al. then determine the expected mass-to-light ratio if all of the stars in the galaxy were drawn from a Salpeter IMF. The Salpeter IMF is the original IMF in astronomy and assumes that the number of stars in each mass bin scales as M-2.3. 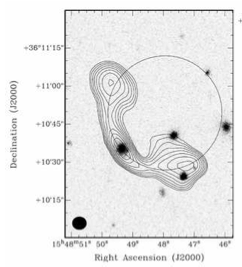 Dividing the observed stellar mass-to-light ratio by the expected stellar mass-to-light ratio allows Cappellari et al. to determine whether the Salpeter model overpredicts or underpredicts the fraction of massive stars in each galaxy. They also compare their results to the expected stellar mass-to-light ratios for Kroupa and Chabrier IMFs with fewer low-mass stars and for two IMFs with more low-mass stars. Cappellari et al. cannot directly observe the shape of the dark matter distribution, so they consider six different models of the dark matter halo. Their “maximum-ignorance” model assumes that the dark matter distribution exactly matches the stellar distribution while their most theoretical model is directly taken from numerical simulations of dark matter halos. Considering a range of dark matter distributions and finding the same result in all six cases allows Cappellari et al. to break the degeneracy between the dark matter fraction and the IMF. Previous studies indicated that either the dark matter fraction or the IMF must vary in different galaxies, but they could not determine whether the dark matter fraction or the IMF was responsible for variations in galaxy evolution. The results of this study indicate that the differences are due to variations in the IMF. As shown in the plot below, Cappellari et al. find that galaxies with low stellar mass-to-light ratios are best modeled by IMFs with fewer low-mass stars (i.e., Kroupa or Chabrier IMFs). As the stellar mass-to-light ratio of a galaxy increases, the galaxy is better described by an IMF with more low-mass stars (i.e., a Salpeter IMF). The discovery that different galaxies are best modeled by different IMFs regardless of the underlying distribution of dark matter is an exciting result because it implies that the IMF cannot be universal. The ratio of the observed stellar mass-to-light ratio to the expected stellar mass-to-light ratio for a Salpeter IMF versus the observed mass-to-light ratio for a range of dark matter halo models. The horizontal lines indicate the ratio expected for a Salpeter IMF (solid pink), Kroupa IMF (dashed green), Chabrier IMF (dash-dot red), or another IMF with many low-mass stars (dotted blue). 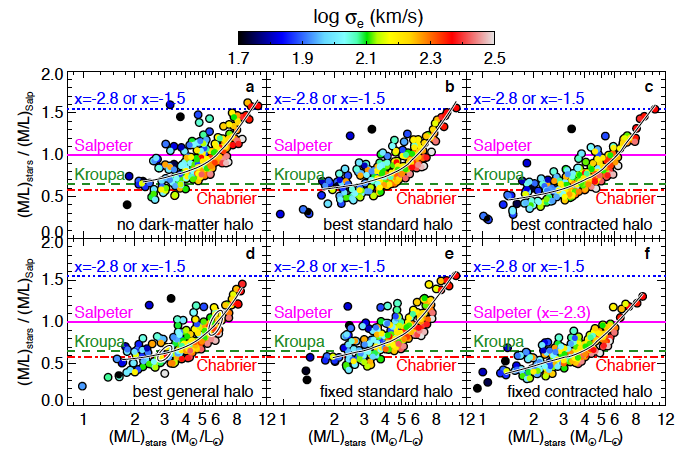 Regardless of the dark matter distribution (which is different in each plot), galaxies with low stellar mass-to-light ratios are best described by Chabrier or Kroupa IMFs while galaxies with higher stellar mass-to-light ratios are best described by Salpeter IMFs. The points marking each galaxy are color-coded by the stellar velocity dispersion, which increases with increasing galaxy mass. The differences among the observed stellar mass-to-light ratios regardless of the underlying dark matter distribution provide strong evidence for variation in the IMF based on the evolution of a given galaxy. Figure 2 from Cappellari et al. 2012. Possible clarification? If a 2 M_o star has a M/L ~ 0.16 and a 0.5 M_o has a M/L ~ 6.5, then a galaxy containing many more low mass stars (ie 0.5M_o stars) would have a HIGHER M/L than a galaxy with more high mass stars. The last sentence in the first paragraph of methods suggests otherwise. That’s absolutely correct. Thank you very much for catching that typo! which is model useing to find M/L?